Audi rolled into the New York Auto Show this week with the the RS5 Sportback, and the automaker’s geeked about its performance numbers: 0-60 in under four seconds, in particular. It’s fast, no doubt. Audi confirmed earlier this five-door coupe was coming, but it sure is pretty, with a sleek and clean design. Inside, it packs a punch: there’s a 2.9 liter TFSI V6 biturbo engine, delivering 444 hp and 443 lb ft of torque from 1,900 to 5,000 rpm. All together, the RS 5 can gallop to 60 in less than 4 seconds, and has a top track speed of 155 mph, with the option of what Audi calls the “Dynamic plus package.” If you’re feeling spicy and pay for that, you’ll be able to hit 174 mph. Audi says the drive force is distributed asymmetrically—40:60—on the axles to boost handling and performance. On the outside, there’s a wide Singleframe grille with RS-specific honeycomb air intakes. Audi touted the car’s “distinct and sporty rear,” accentuated by a RS-specific diffuser and oval RS exhaust pipes. Very RS all around. 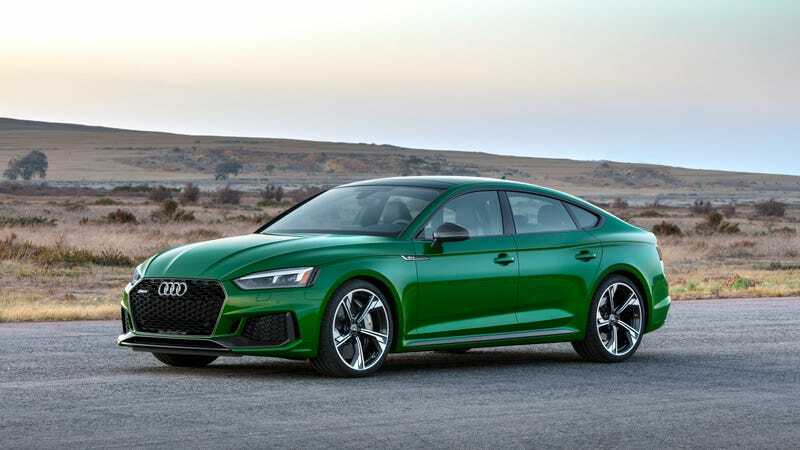 Beyond the performance specs, Audi is equipping the RS 5 with a suite of driver assisted aids, including Audi-specific named features for forward and side collision detections adaptive cruise control, and lane assist. Basically, it’s a sport trim for the RS 5, with the same specs. Audi says it’ll be on sale in the second half of this year.